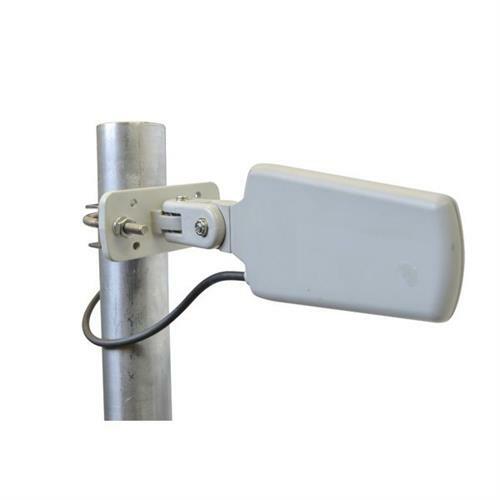 This high quality and reliable Yagi Antenna can be used for any of the wireless applications that fall in the 4.4-6.0 GHz frequency range. These include WiFi 5 GHz, DSRC 5.9 GHz, Public Safety 4.9 GHz or Military 4.4 GHz. The YAG12 antenna’s compact size also makes it a nature choice for In-building installations. The YAG12 Series offers 10 dBi gain from 4.4-5.4 GHz and 12 dBi gain from 5.47-6.0 GHz. This makes the antenna very effective for applications such as mesh systems, point-to-point or point-to-multi-point. ISP and Service Providers will find these antennas particularly efficient for short range backhaul applications or for providing coverage in hard to cover areas such as in an in-building corridor. This YAG12-5500 model covers 4.4-6.0 GHZ and can be used for military 4.4 GHz, public safety 4.9 GHz or WiFi 5.2-5.8 GHz. The antenna is built with 1-foot (305mm) of RF-915 cable. Mobile Mark XW-241-FP7 High Gain 2.4 GHz Flat Panel Right-Hand Circular Polarized design Antenna, Indoor Wall Mount for Wi-Fi.